While the inversion seen between 3-month Libor and the US Treasury 10-year yield has attracted headlines, we would add a couple of important caveats. Libor is not what it was. It's no longer the “interbank rate”, rather it is essentially where banks print commercial paper (CP). With (virtually) no volumes going through the interbank market, banks need to hang their estimates on something tangible (hence the CP reference). And importantly, this overstates the “3-month rate”. Note that 3-month Libor trades some 20bp above 3-month T-bills, and 3-month bills vs 10-year US Treasury isn't inverted. Also, the 10-year Treasury yield is understated. We see this on a number of fronts. First, the New York Fed estimates the 10-year term premium at -80bp. It has never been lower but has been hammered down ever since the Fed first engaged in quantitative easing (QE). This should be no big surprise, as the Fed’s buying of bonds pushed market yields below levels that would otherwise have obtained, a simple supply/demand dynamic, where the Fed augmented the bid for bonds. Even though the Fed has since engaged in quantitative tightening (QT) through not reinvesting bonds that roll off its balance sheet, echoes of the negative term premium remain. This aggressive negative term premium is also seen in a benign inflation breakeven discount as implied from the inflation-protected Treasury market. The implied breakeven inflation rate is 1.8% for the coming five years. This compares with a current (urban) inflation rate of 1.5%, and within the past year, this was at an oil price impacted 3%. The current breakeven leaves little wiggle room to the downside. Bottom line, reflective of a large negative term premium and a very benign implied inflation expectation, the US 10yr yield is quite low for what is still a bubbly economy. And, despite the froth, an angst narrative dominates the market discount. The 2/5yr curve has technically inverted, and the 2yr has traded through the fed funds rate, as is typical when the Fed has peaked historically. Consequently, we find that the market discount is decidedly negative on the macro prognosis. It is a discount that sees a rate cut as probable in the coming quarters and sees minimal inflation risk in the coming years. 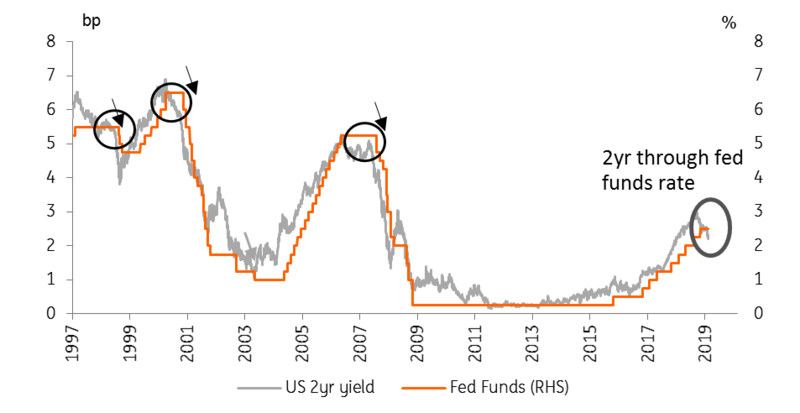 If the next move in the fed funds rate is down, then history also shows that the 10yr can trade 25-50bp through in anticipation. That is consistent with the 2% to 2.25% area, which incidentally is where we identify neutrality to be (to generate a zero real rate at flat to core inflation).